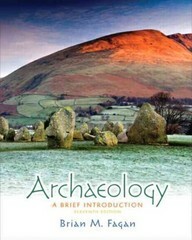 Archaeology 11 Edition Method and Theory in Archaeology Archaeology: A Brief Introduction is an introduction to the fundamental principles of method and theory in archaeology, exposing students to archaeology as a career. The text begins by covering the goals of archaeology, and then moves on to consider the basic concepts of culture, time, and space, by discussing the finding and excavation of archaeological sites. By providing a distinct emphasis on the ethics behind archaeology, and how we should act as stewards of the finite records of the human past, Archaeology: A Brief Introduction continues to be a book with a truly international perspective, not simply focusing on North America or Europe. Teaching and Learning Experience Improve Critical Thinking - Archaeology: A Brief Introduction's "Archaeology and You" chapter provides students with career advice in an era when archaeology is transitioning from predominantly academic to professional. Engage Students - Each chapter within Archaeology: A Brief Introduction highlights important finds that have shaped our archaeological perspective, and a global perspective that shows students that archaeology is the most global of all sciences, encompassing all of humanity.